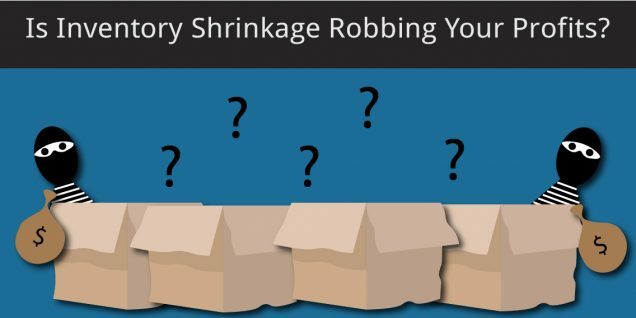 Is Inventory Shrinkage Robbing Your Profits? Here's How To Fix It! Is Inventory Shrinkage Robbing Your Profits? Inventory is an important part of your business. It’s what makes you money! Inventory shrinkage reduces the potential profit that you could be making. Shrinkage happens due to many different reasons and results in changes to your business and an overall loss of sales. This identifies what items from your inventory have been recorded on hand, but actually aren’t there. Inventory shrinkage affects any type of business, but it mostly happens in the retail industry. Inventory shrinkage happens when the physical count of your items or merchandise do not equal the same as the amount your records show. It is important, even with the best inventory management system, to still conduct a physical count of your on-hand inventory periodically. There will always be some unaccounted for. This is what is called shrinkage. Some shrinkage happens, but if it happens too often or with a large amount, there could be problems within your store. The National Retail Federation’s 2017 security survey estimated that shrinkage took almost $49 billion out of retailers’ pockets during the previous year. What Are The Sources That Cause Shrinkage? Inventory shrinkage is a result from many factors. Some are cause by theft, misplaced items, inefficient records, or shipping and order errors. If there is a paper trail, it’s easier to see where and what went wrong. The leading reason for shrinkage in your inventory is due theft. Of course, most theft happens in the form of shoplifting, rather than a large scale break and enters. Shoplifting accounted for over 36% of losses in the 2017 study. Although shoplifting is a main cause, there is also a large percentage of internal thefts by employees. It is hard to think of your trusted employees stealing from you but it does happen. Another prime source of shrinkage comes from administrative losses. An example is data entry errors where an extra zero is added, or items are added more than once. These losses come down to human error. In most cases, there is a paper trail to see where the error was made. Shipping and order errors happen because, similar to administrative losses, they are done by humans and humans make errors. Inventory shrinkage has a negative effect to your business’s bottom line. It affects prices and wages, the amount of security that is needed, as well as management and training. In most cases, businesses must raise the prices of their merchandise to make up for lost sales. Other times, businesses have to lower wages for employees in order to stay competitive with their prices. Although this helps your customers, it makes it difficult to keep your employees or find high quality employees. Shrinkage also affects your business’s security. Generally, businesses have some form of security. When shrinkage occurs, it causes companies to heighten their security. Sometimes it is the form of plain-clothed or uniformed guards, monitoring the activities of employees and customers, security cameras, or even control measures for bookkeeping and inventory. When these losses happen to a business, they may also put more focus on training for staff and management. Another way businesses deal with shrinkage is by having managers focus on loss prevention. They use different programs to monitor this, which takes more of their time away from day-to-day operations. There are a few areas that you should focus on when managing your inventory shrinkage. Nothing is a foolproof plan, even if you’re taking all of the precautions. However, every bit helps! Improve the security around your business using cameras, ensuring you have a few on both employee and customer areas. Use a combination of locked and code entry doors. Try placing valuables in locked cases or behind the registers. Delegate certain employees to accept, open, and distribute the new incoming shipments. As well as, have these employees log the inventory immediately after. This will help create a paper trail in case of a problem or missing items. Be on the lookout for employees who regularly void cash transactions! Review the day’s transactions with employees and each one should have their own password or user ID number to use the register. By doing so, you will know which employee you suspect could be stealing or if some employees need additional training. If you are noticing a large shrinkage, verify any orders, invoices, or receipts are correct before they are filed will help. Having an organized system and paper trail, with back-ups also help! If you notice that customer theft is very high in your business, try hiring a security service to guard your store! It is important to take a look at where the losses are coming from within your business. Even if it seems like a tiny amount at the time, it eventually adds up! Count your physical inventory once or twice a year to compare your actual numbers to what your log sheets say. Divide the value of your physical inventory by the value of your suggested inventory, multiply by 100 and subtract this number from 100 to find the percentage of shrinkage you are experiencing each time you count inventory. Compare these percentages over time to see if your shrinkage is reducing or growing! An inventory management system is another solution to check your inventory. Check out Clear Spiders Solutions and book a demo today! Next:Does Your Warehouse Check All The Boxes In This Freezing Weather?